It’s finally that time of year, folks: the movie lovers’ Superbowl! The Oscars. Around August every year, I begin my preliminary Oscar predictions, updating them every month or so, with films that I think will make the cut. This year, I was pretty spot-on with my predictions. However, there were a few surprises, both good and not-so-good. But now that the nominees are official, it’s time for the MovieGuise to make our predictions for who will take home the coveted golden statuette. With 14 nominations, La La Land ties (again) the record for the most Oscar nominations by a single film. The only two films to have achieved this feat before are All About Eve (1950) and Titanic (1997). Both films went on to win the Oscar for Best Picture, with the latter also tying the record for most Oscar wins by a single film. Earning her 20th nominations, Meryl Streep broke her own record for the most nominated actor of all time. Streep has previously won 3 Oscars. If she wins this year for Florence Foster Jenkins, she will tie Katharine Hepburn for the most Oscars won by an actor. Of the 20 nominated actors this year, 7 of them are persons of colour, making this the most diverse year for actors at the Oscars. 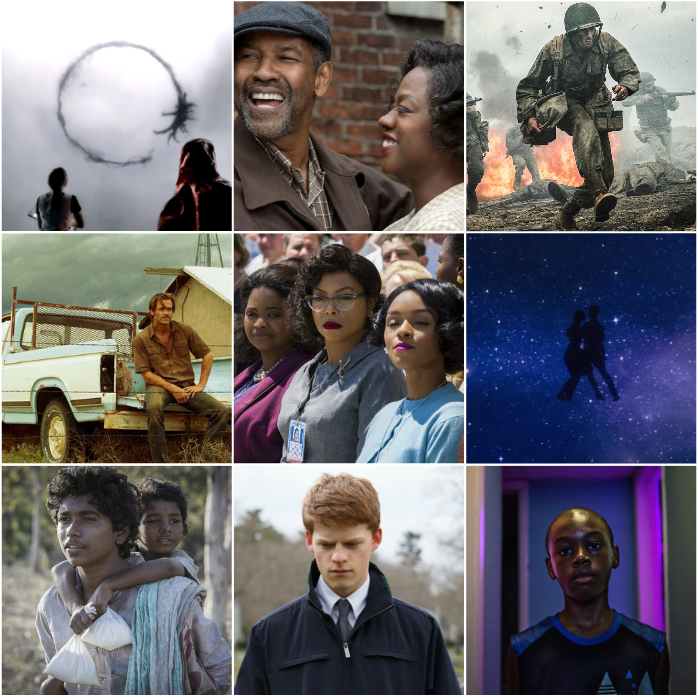 There are 4 films nominated for Best Picture this year whose casts are made up entirely or almost entirely of actors of colour. This is more than any other year. Viola Davis is now the most Oscar nominated black, female actor of all time. She has now been nominated three times. Meanwhile, Octavia Spencer joins the ranks of Viola Davis and Whoopi Goldberg as being the only three black, female actors to receive more than one Oscar nomination. Having previously won, this also makes Spencer the first black, female actor to be nominated after a win. Lucas Hedges earning a nomination for Best Supporting Actor for his beautiful and heart-wrenching performance in Manchester by the Sea. Hidden Figures earning a nomination for Best Picture. “Audition (The Fools Who Dream)” was one of the only things about La La Land that actually moved me. So seeing it earning a Best Original Song nomination was pretty exciting. Borrowed Time getting nominated for Best Animated Short. I watched this months ago and had no idea it was even in contention for the Oscars. And I loved it. Seeing it nominated was a very pleasant surprise. I knew it wasn’t going to happen, but that doesn’t mean I was any less disappointed when Jessica Chastain was left off the Best Actress list for her powerhouse performance in Miss Sloane. Again, I knew it wasn’t going to happen, as she’s been left out of every other race this year, but I was bummed that Taraji P. Henson wasn’t nominated for Best Actress for Hidden Figures. Another one I predicted beforehand, but I’m nonetheless irritated that La La Land has tied the record for most nominations by any film. I really don’t understand all the fuss about this movie. For me, La La Land was rather like getting a gorgeously wrapped gift, but opening it only to find that it’s something you already have tons of and didn’t really like in the first place. Simon Helberg not being nominated for Best Supporting Actor for Florence Foster Jenkins. And yet another one I knew was a long shot, but I was sad that Captain Fantastic didn’t get a Best Picture nod. Second only to Hidden Figures, this was my favourite film of the year. I cried through the last 20 minutes of the movie and probably for another 10 minutes after that. Michael Shannon being nominated over costar Aaron Taylor-Johnson for Nocturnal Animals. I didn’t hate Shannon’s performance, but Taylor-Johnson was the driving force of the film. While we’re on the subject of Nocturnal Animals, I can’t believe it was only nominated in one category! Kubo and the Two Strings being nominated for Best Visual Effects. Now, I’m clearly no expert on what is considered visual effects, and Kubo was an amazing film, but should an animated film really qualify for Visual Effects? Technically, isn’t the entire thing visual effects? Again, I don’t know how they decide these things, and I’m mostly just bummed that Fantastic Beasts and Where to Find Them didn’t get a Visual Effects nomination. And now for the nominations! I will list them ranked from my favourite to my least favourite. What will win: Literally no idea, they’re all so great! Moonlight, maybe? * Denotes my indecision with one of the categories the film is nominated for. * Denotes including Best Adapted Screenplay, where I chose all 5 nominees.